To make the most out of your JUST RUN session and to increase physical activity, have the children run in place while waiting for their turns. 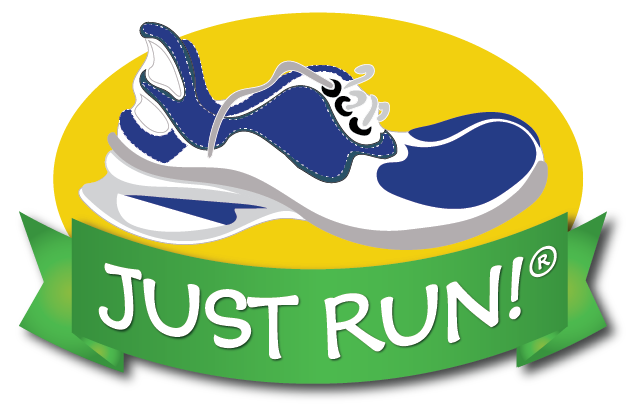 EXTREMELY IMPORTANT parts of the JUST RUN program are the recommended drills and relays for children. The drill packages have been developed to best prepare young legs and bodies for running. They are fun to do and improve agility, balance, coordination, strength, and conditioning and are the perfect complement to JUST RUNNING for school age children. A video demonstration is found in the section "Informational and Training Videos" on the website. It is best to organize lines of 4 or 5 children for relays. Instruct them to run easy or have them run fast to compete against each other. We suggest having them run slowly and non-competitively until they understand all of the variations. Try to evenly BALANCE the teams so they finish approximately at the same time. Important note: The relays and drills are preferably done using soccer balls that are LOW ON AIR and FLAT on one side. They will not roll away and are not as subject to injury if stepped on. We find that children love stuffed animals to go around and over, as well as soccer balls and/or objects of your choice. This adds VARIETY AND FUN. These relays are best done on grass rather than cement or hard surfaces. 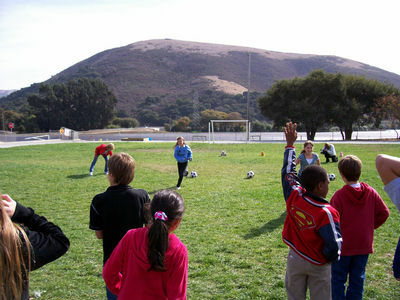 Place several soccer balls - one for each group of children - 30 yards away from the starting line of the children. Each child runs to the ball, around it and then back to the group - TAGS the next person - who then does the same until all on the team have run. Variations should be done by having them first run around the ball from the left, then from the right side. Do this typically 4 times - twice from the left, twice from the right. Variation: Each child starts from a KNEELING position, first on the right knee, then on the left knee. Repeat 4 times, twice on the left knee and twice on the right. Variation: Leaders of the lines start by LYING ON THEIR BACKS, heads facing the balls. When hands are tapped, they turn over and then start running. For variety, have the children roll to the right or to the left, according to instructions. Variation: Set a ball out about 30 yards from each line of children and a SECOND BALL or animal at 60 yards. Have the children do activities around or over each object before returning and tagging the next in line. This adds distance to the drills and relays. The drills begin with a straight line of children; they individually run over and around a line of evenly separated soccer balls, or objects, and then return to the end of the line. Begin with six selected items and work up to 15 over a period of several weeks. DRILL1: The balls should be less than three feet apart. Children run over the balls quickly, one at a time, in a running motion. When finished, they go back to the end of the line. Repeat. DRILL 2: The balls should be about two feet apart. Children jump over the balls with legs together. Moving the arms helps with momentum. When finished they go back to the end of the line. Repeat. DRILL3: The balls should be about three feet apart. Children swerve through and around the balls. When finished, they return to the end of the line. Repeat. DRILL 4: High Knees - The balls should be about three feet apart. 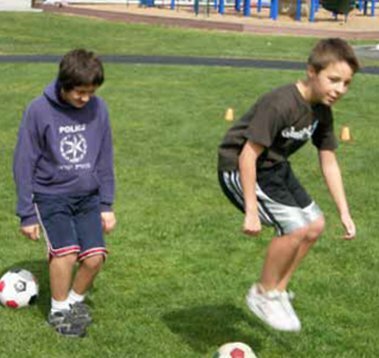 Children bound over the balls with alternating legs, lifting knees as high as possible. Repeat. SUPPLEMENT drills 1 - 4 by doing push ups, sit ups, jumping jacks, etc. between drills. Also, have the children run around the field, track or designated distance between drills, to add endurance. On ALL of these drills and relays, it is important that there is not much rest time between running and activity. They need to be moving as much as possible. However, encourage cheering, team spirit and cooperation while waiting for their turns. FITNESS STATIONS: Children run for a minute or two between fitness stations and then do push ups, sit ups, jump rope, ball toss or other exercises, for a designated time, before being signaled to run to their next station. BUDDY RUNS: Pair some of your faster children with your slower children for a run together. The faster kids slow down a bit and enjoy "helping" and the slower kids are encouraged to run faster and work harder. RELAY RUNS: Again pair the slower kids with the faster kids. Try to equalize teams and run relays. SHORT RACES: Short races are challenging, fun, add variety to your program and encourage faster running. BEAN BAG RELAYS: Divide the group into teams. Put a bean bag (or other item) for each team member, at some distance from the teams. Each person runs, one at a time, picks up the item, and runs to the designated finish area. When they reach the finish area, the next person on the team runs, picks up their bean bag until all the children have had their turns. TEAMWORK RUNS: Line up teams of 4, 5 or 6. Teams of kids run single file around the track or field. When the coach blows the whistle, the last person in each line sprints to the front. Everyone cooperates by staying in line. Do this until each member of the team is back in original position. This promotes teamwork and pacing. INCREASING DISTANCE PRACTICE: Form teams of similar speeds. The kids run at least 1/2 mile (800 meters) in a group. Everyone must stay together. Increase the distance on a regular basis. RELAY RACES around the track or field: Use relay batons or similar items. Teams compete against each other. Stagger the children around the track, approximately 100 meters apart. They pass the baton to each other and continue running. BALLOON RELAY: Have a balloon for each relay team; runners pass the balloon to the next relay member. Watch the fun as they make sure the balloons don't fly off! Vary distances. This drill works well with any number of teams and children. CAT AND MOUSE: Fox and Hounds/Teacher and Student. There is a variation of Cat and Mouse called Fox and Hounds. On occasion, invite a teacher or principal to participate. The invited guest begins running and then the children are signaled when to "start the chase." The teacher should run at a comfortable pace to encourage all the children to catch up and eventually run with the accumulating group. Or, one of the faster students can be designated as the HOUND and everyone else as a FOX. The HOUND starts behind and catches up/tags as many runners as possible, the FOXES. The HOUND can run moderately and make sure other runners ahead of them continue running or they can pursue and anyone they catch/tag has to stop running. The HOUND tries to catch as many other FOXES as they can. This is particularly challenging for competitive children. OBSTACLE COURSE: Using cones, buckets, playground equipment, etc. (use your imagination) have everyone run around and over the objects. RUNNING FOR TIME: Time each child's one mile run (run/walk). On a regular basis, perhaps monthly, time them again. They will be delighted to learn of their increased speeds and fitness levels! Take advntage of this feature in JUST RUN Across the USA. WHISTLE RUN/WALK: Blow the whistle and they run, blow again and they walk, blow again and they run, etc. FOLLOW THE LEADER: Send everyone out in groups with similar abilities and they run in a line alternating leaders - wherever the leader wants to take them. WIND SPRINTS: These are more aggressive workouts that should not be done the first few weeks of running. Draw two lines and have runners run as fast as possible from one line to the other, then rest and repeat. EXHAUSTED 400 HERO RUN: At the end of a workout, when everyone is tired, surprise them by telling them to run fast for another designated distance, 400 yards or 200 for example. Call it a HERO run. Three sets of experts were asked to create a workout plan that provided great overall fitness packed into a 30 minute time period. They suggest doing these three times a week but just one is a wonderful way to fill a half hour. They are more intended for adults or 7th and 8th graders but can be used for younger children as well by cutting back a bit on each part. Start with 5 minutes of calistenics including pushups, pullups, sit ups (crunches), and lunges. Work up to 25-50 pushups, 10 pullups, 25 to 50 crunches, and 10 lunges with each leg. Run 5 minutes very easy for warm up. Run 15 minutes at a fast pace. Finish with 5 minutes of cool down stretching. Run easy for 6 minutes for warm up. Do 8 accelerations (speed ups) of 30 seconds each followed by 1 minute of slow running. Do a 10 minute acceleration run starting the first two minutes relatively easy and increasing the pace each two minutes. Finish with 2 minutes of walking and gentle stretching. Easy warm up jog of 2 minutes. Run 8 minutes at your regular pace. Then walk or jog for 2 minutes. Run 8 minutes at slightly faster pace. Then walk or jug for 2 minutes. Run 6 minutes at a fast pace. Fitness Stations: Run for a minute or two between fitness stations and do push ups, sit ups, jump rope, ball toss or other exercises you might design for two minutes each before moving to the next station. Buddy Runs: Pair some of your faster children with your slower children and tell them to run together the entire time of your planned run. It helps the faster kids slow down a bit and enjoy it and it helps the slower kids speed up a bit and work harder. Relay Runs: Again pairing the slower kids with the faster kids - try to equalize teams and run relays. Hersheys' Fast Track to Sports is a program developed by experts in Track and Field. Hersheys' supports local track and field competitions that included 400,000 youth and a National Competition each year with 550 of the fastest youth runners and jumpers. Visit www.hersheystrackandfield.com for more information. Short races: 15 to 25 yard races teach proper start and form techniques. Start 5 or 6 children at a time and race short races emphasizing proper start position and focusing on quick short steps during the races. Repeat several times, as long as the races remain fun and engaging! Bean Bag Relays: Divide the groups into teams and put bean bags or other items that can be picked up at some distance from the teams. Each person runs, one at a time, picks up the item, and runs to a designated finish area. When they are finished the next person on the team runs, etc., until the team is fnished. Team Run Race: Line up teams of 4 or 5 or 6 and run single file around the track or field. When the coach blows the whistle, the last person in the line sprints to the front of the line. Everyone cooperates by staying together. Do this until each member of the team is back in the original position. This can be used to increase running distance as you add more people to each team. It also emphasizes good pacing. Middle Distance Practice: Form teams and run at least 1/2 mile (800 meters) in a group. Everyone much stay together the entire way. Use increasing distance at weekly sessions as you go through the school year. 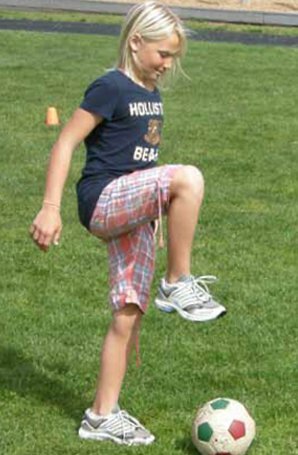 Relay Races: Around the track or around the field. Use relay batons (can be made from PVC pipe if you don't have actual batons). Designate teams to compete against each other and place one person from the team at various distances away from the start. Typically on the track you would designate 100 meters for each person. Each team member must pass the baton to the next member and continue running.